Arthur was born in Newbury in late 1873 the third son of William Bance and his wife Linda Mary (née Brooks). Linda was born in Tottenham but came to Newbury when her father took over the lease of the Globe Inn, once Newbury’s most prestigious inn but, by the time John Brooks took it on its glory days were past. William Bance was a wool merchant or ‘stapler’ with premises in Bartholomew Street, a short walk from the Globe. He and Linda married in 1864 and had three children, Lillie (born 1867), William (1869) and John (1871) before Arthur. There were to be no more children because Linda died within weeks of Arthur’s arrival, very possibly as a result of the birth; childbirth was a far more risky undertaking in those days. After school Arthur was apprenticed as a draper in a Tunbridge Wells department store, R W Weekes’. Following his time in Tunbridge Wells Arthur disappears from official records; he turns up in Australia in 1915, working as a clerk and living in Wagga Wagga, New South Wales. His older brother, John, had been in Wagga Wagga for some time, marrying there in 1892, it is not clear whether Arthur travelled to Australia with his brother or joined him there at a later date. On 16 July 1915 Arthur enlisted into the Australian Imperial Force as an infantryman. He lied about his age, knocking three years off and claiming to be 38 years 8 months old. The age limit was originally 38 but was raised to 42 that same month, perhaps Arthur was not aware that he no longer needed to lie? Part of Arthur's very busy casualty record. His military record is not covered in glory, being dominated by his medical record. He was posted to the 13th Battalion, AIF (Australian Infantry Force) and shipped over to France via Alexandria and Marseilles arriving at the latter on 8 June 1916. On Christmas Eve 1916 he was admitted into hospital with what must have been a severe case of scabies (infestation of the skin-burrowing scabies mite), resulting in three weeks treatment at the 39th Casualty Clearing Station (CCS) at Allonville. He rejoined the 13th Battalion of 13 January, only to return to hospital two weeks later. This time he was diagnosed with adenitis (inflammation of a gland or lymph node) – he was probably relieved to hear that this was diagnosed as ‘non-venereal’. On 10 March he returned to his battalion until October when he returned to hospital for three weeks, to be treated for scabies again. In February 1918 he once again has a spell in hospital with scabies. On discharge he was given three weeks leave returning to duty on 9 March 1918. The next entry on his medical record is more serious, recording that he was wounded in action on 11 August 1918. On 8 August 1918 British Third Army (including Canadian and Australian Corps) and French forces launched an offensive know as the Battle of Amiens. This was the second summer offensive against the Germans, following a very successful attack by the French on the Marne in late July. The British used new tactics which had only been tested in small raids to date, combining tanks, ground attack aircraft, artillery and infantry; it was the birth of modern all-arms warfare and smashed a 14-mile wide gap in the German lines. By the end of the first phase on 11 August all the ground lost to the Germans during their spring offensive had been regained and the end of the war was at last in sight. For this reason the 8 August 1918 is sometimes known as the ‘day the war was won’. The four days of fighting saw the Third Army take casualties of 22,000 killed, wounded or missing; German losses are put at 74,000. Arthur’s battalion was part of the 4th Brigade AIF and was involved in a rapid advance from 8 to 10 August. On 11 August they withdrew for a rest and the brigade war diary reports Bright warm day. All units resting, refitting and swimming in the Somme. Nucleus personnel were changed over and all units ready for a move at a moments notice, though it is expected that we shall have at least 24 hours rest here [Sailly-le-Sec]. By nightfall all ranks had provided cover for themselves out of whatever material they could gather in the area. Casualties for the 24 hours 2 killed and 5 wounded. 8th August, 1918 by Will Longstaff (Australian official war artist). German prisoners being escorted to the rear, Royal Horse Artillery moving forward. It appears that Arthur had the good fortune to survive their offensive actions but had been wounded as they withdrew from their forward positions. He was admitted into the 41st CCS on 12 August where he might have been patched up before he was passed on the the 1st South African General Hospital the same day. The following day, 13 August 1918, Arthur died of gunshot wounds (to his buttock and left thigh) and shock. He was buried in grave IV.C.22 at Abbeville Community Cemetery Extension. 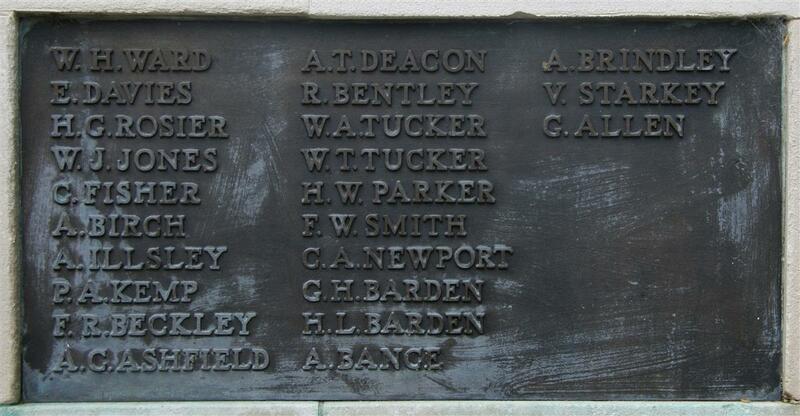 Locally Arthur is remembered on Tablet 6 of the Newbury Town War Memorial., the parish memorial board and roll of honour in St Nicolas’ Church. Thanks to Karen Newbery for her help researching this soldier and to Mark Collins for the picture of Tunbridge Wells.